Are you looking for menstrual cups on Amazon? You’ll often see Skinco as one of the top search results. Is it a winner, or should you consider another one? Read our buying guide for the Skinco menstrual cup to help you decide if it’s the right one for you. For years, the only menstrual cups on the market were the ones from reputable companies such as The Diva Cup, MoonCup, and The Lunette Cup. These companies are still around today and selling top-quality, eco-friendly period cups made from the highest quality medical grade silicone. They truly are products you can feel safe inserting into your body for up to a week each month. I personally use the Diva Cup and love it. In the past couple of years, there has been a huge influx of cheap menstrual cups from China on Amazon. Many (most?) of them have fake reviews so appear to be good, but appearances are sometimes deceiving! These cups are not made of the highest quality medical grade silicone, but instead a very flimsy alternative. This makes them extremely difficult to insert and remove. Insertion is difficult because they won’t pop open and suction properly. Removal is difficult without all the fluid spilling everywhere. What about the Skinco Cup? Is it a high-quality cup or a cheap imitation? The Skinco Menstrual cup appears to be one of these cheap Diva Cup alternatives out of China. I personally wouldn’t buy it, or insert it into my body (even if given it for free!) for the following reasons. Priced at around $10 for 2 cups, Skinco Menstrual Cup is simply too cheap. The top quality cups manufactured in North America or Europe are around $30 per single cup. You get what you pay for, and in this case, you get a top-quality feminine hygiene product that does what it says it will do. The cheap cups you’ll see on Amazon source their products from factories in China for around $0.25. They’re so cheap because they’re not made with medical grade materials to exacting standards. For a product that goes inside your body for up to a week each month, isn’t it worth it to spend a little bit more? We certainly think it is. All the more established, top-quality menstrual cups have company websites. On these websites, they talk about the materials they’ve used in manufacturing, country of origin and then also offer warranty/refund information. Skinco appears to not have a website and I couldn’t find any information about where it is manufactured. If you take a look at Amazon, you’ll notice that the reviews for this menstrual cup are pretty decent. However, almost none of the five star ones are verified purchases. This is a sure sign that the company paid for reviews. If you look at the product description on Amazon, you’ll notice that the English is very awkward or just plain wrong. This is a sure sign that it’s not a North America or European made product. If you’re looking for your first menstrual cup, give the Skinco Menstrual Cup a wide berth. It appears to be a very cheap product out of China and there is a huge lack of real information about the product. Spend a little bit more money and get yourself a great product from a reputable company. If you buy one of the very cheap menstrual cups, you’ll often end up buying a better one in only a few months when you find that it doesn’t work well. 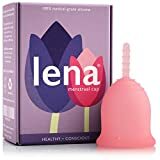 The Lena Cup is a recent addition to the menstrual cup world, and it’s very popular for good reason. It fits well, is made in the USA, is reasonably priced and most people who use it seem to love it. 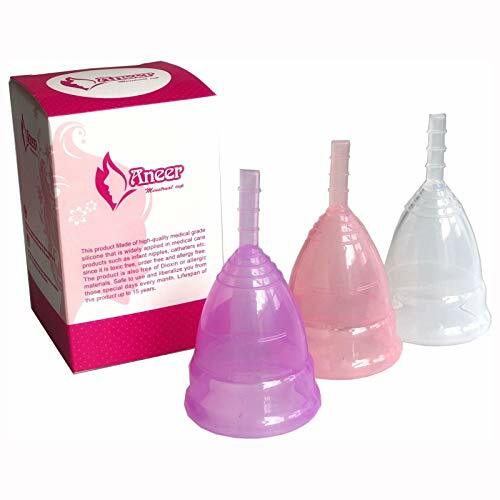 The company is dedicated to providing a top-quality menstrual cup at a very reasonable price. Are you looking for the best price in a period cup, or are you more worried about quality when you head over to Amazon to find yourself a new one. « BodyBay Menstrual Cup Review: Is the Right One for You? Thanks very much for the useful info.